Choosing your child’s school is one of the most important decisions you’ll make for them. The right education can open doors, but a well-rounded Catholic education can open their future. Outstanding academics and individual attention, along with a focus on moral excellence is our goal at All Saints Catholic School. We want each child to become the unique person God created them to be. Come see for yourself! 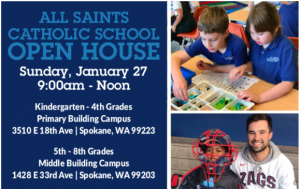 Join us for our Open House this Sunday, January 27th from 9am-Noon.